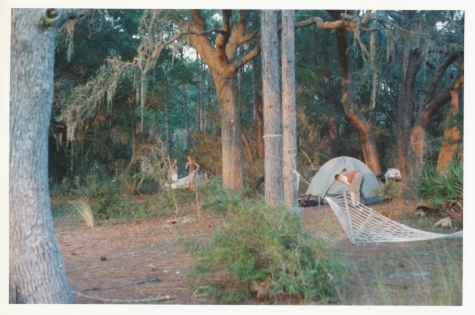 Description: Eleanor Savage, Morgan and Barbara setting up camp in a wooded area of Sapelo Island. There is even a hammock. Eleanor Savage is a good friend of both Morgan’s and Jennifer’s. She is originally from GA and it was great to have her knowledge and experience with us at this remarkable place. We had amazing storms. The most powerful part of the experience was meeting the people there and performing for Mr? …. As he watched from his porch and hearing his stories of working for Mr. Reynolds and traveling around the world with him on his yacht. His experience of race on his journies were particularly compelling especially his stories about PR were significant to Javier.